Extends HDMI signals over single CAT5e/6 cable up to 60 meters without quality loss. 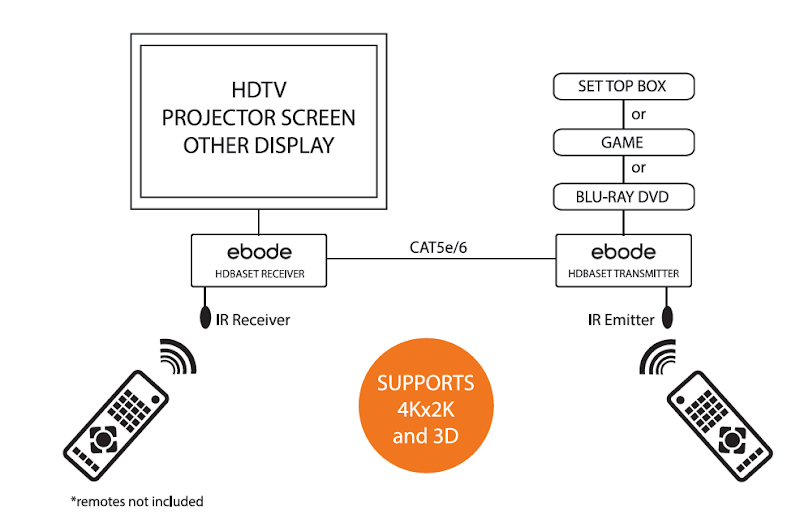 The ebode HDBT600 HDBaseT Extender, extends HDMI signals over single CAT5e/6 cable up to 60 meters without quality loss. It includes HDMI features as 3D support, deep color 4K (including 1080p, 1080i, 720p, 480p) and bi-directional IR over the same cable. CEC and DVI-D computer video can also be transmitted with a DVI-to-HDMI cable. The HDBT600 is compliant with HDCP 2.0 standard and supports PCM 2 Channel audio, 5.1, 7.1, DTS-HD, Dolby audio format. The HDBT600 is an all-in one designed transmitter and receiver set for placing your device in any location. It is a perfect solution for digital entertainment and for any installation requiring superior HDMI video quality over large distances.